Updated Monday March 4, 2019 by Sam Clift. 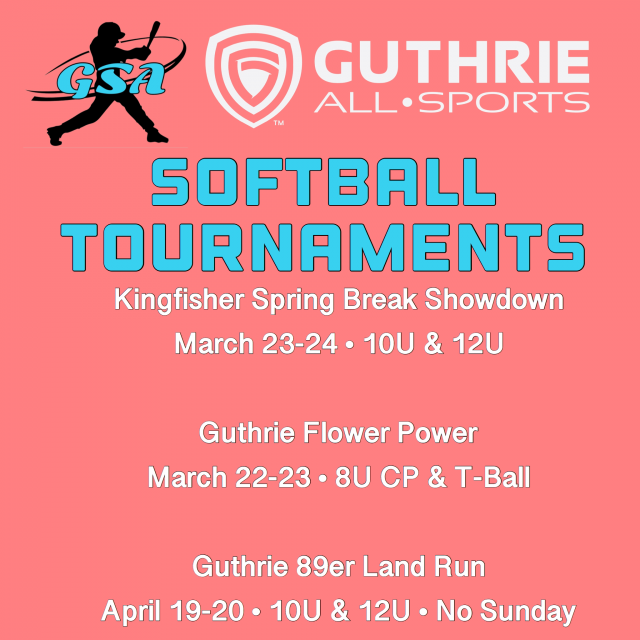 Guthrie 89er Land Run, 10U only Tournament, B&C teams only. Saturday, No Sunday. There will be parades, gunfighters, food trucks and a carnival throughout Downtown Guthrie that weekend, enough fun for the whole family..Rings and Bracelets to the Carnival for Winner and Runner Up! Format and Game Guarantee will be determined by the number of teams in each age group. Games will be played at the Owen’s Field 203 S. Academy. Entry fee will be $150 and we’ll take the 1st 16 paid teams. To enter contact..